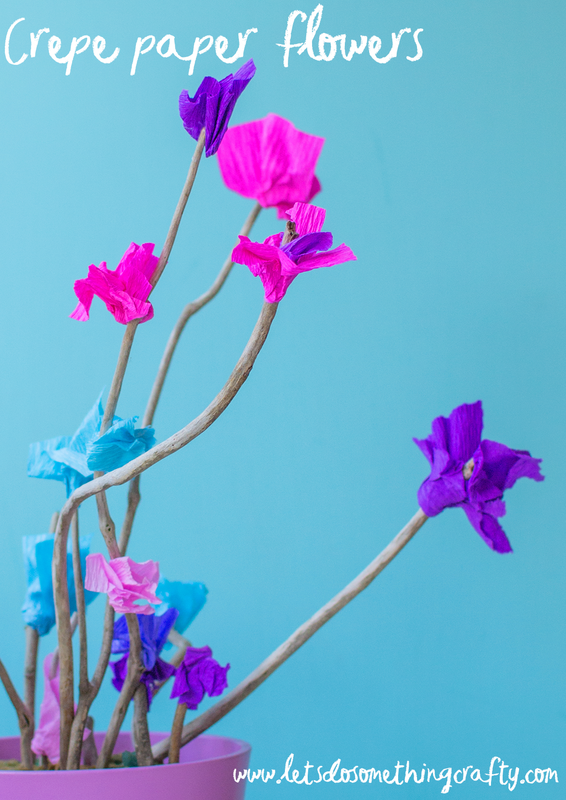 These handmade flowers are so pretty and couldn’t be easier to make. 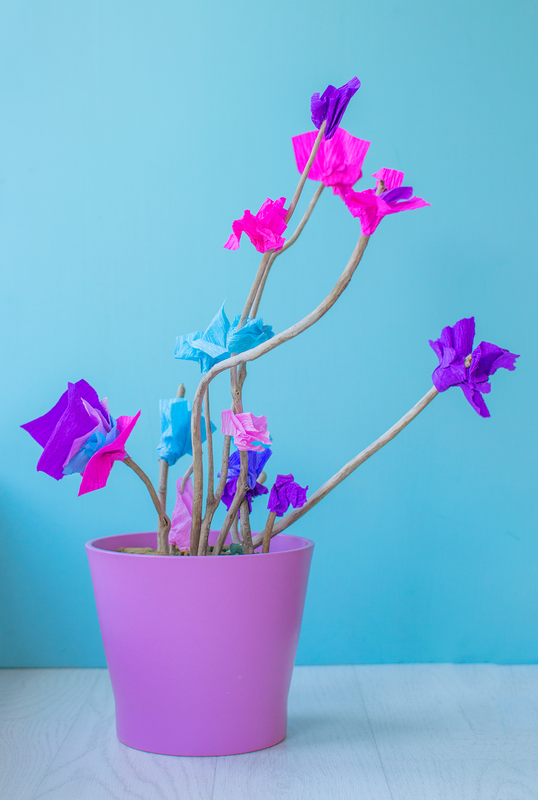 I will show you a few different ways to make them but it’s completely possible without using glue or anything messy. 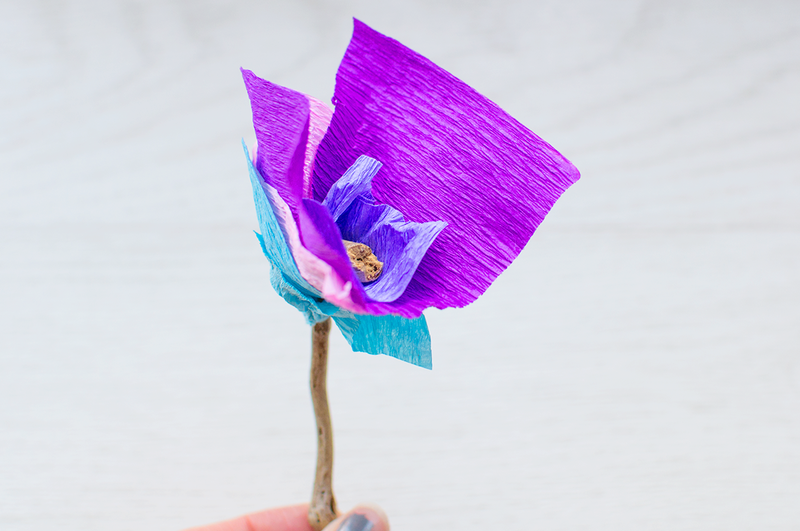 So you could actually do this whilst sitting out in your garden or if you take some crepe paper out with you on a day out then it can be a fun activity for the kids. 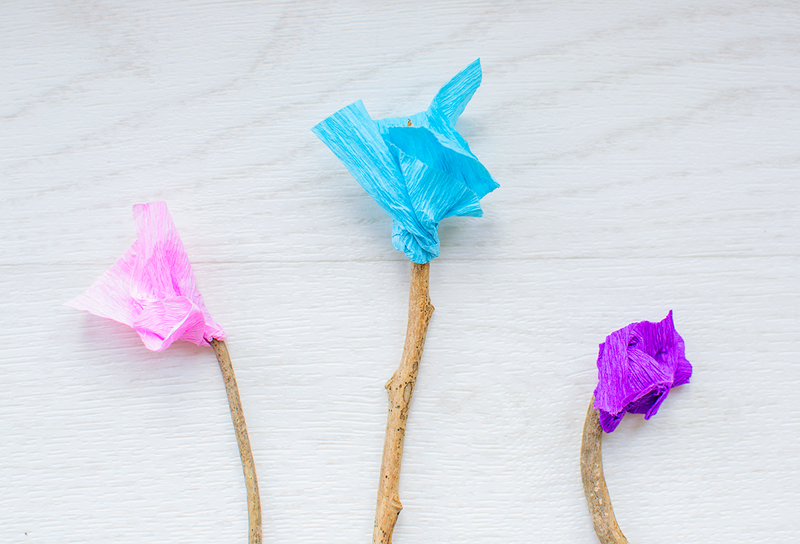 They are actually made with sticks which is why all you need to take out with you is crepe paper, the fun part would be searching for sticks to use. We actually have a huge pile outside in our driveway and every time I get home at this time of year I end up bringing some in the house to use in craft projects. 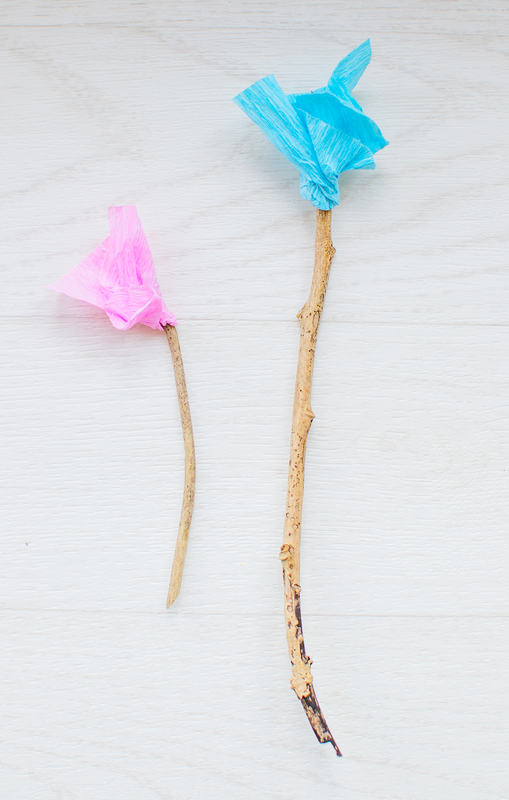 We’ve made stick flowers before but they looked a bit more like they had been made by children, these are a bit different in that they look really pretty and could be used for weddings. I actually have weddings on the brain as my partner of 13 years finally asked me to marry him a couple of weeks ago! The sticks could be spray painted in a colour or with glitter to make them look a bit more special but I quite like the rustic look of the plain sticks. 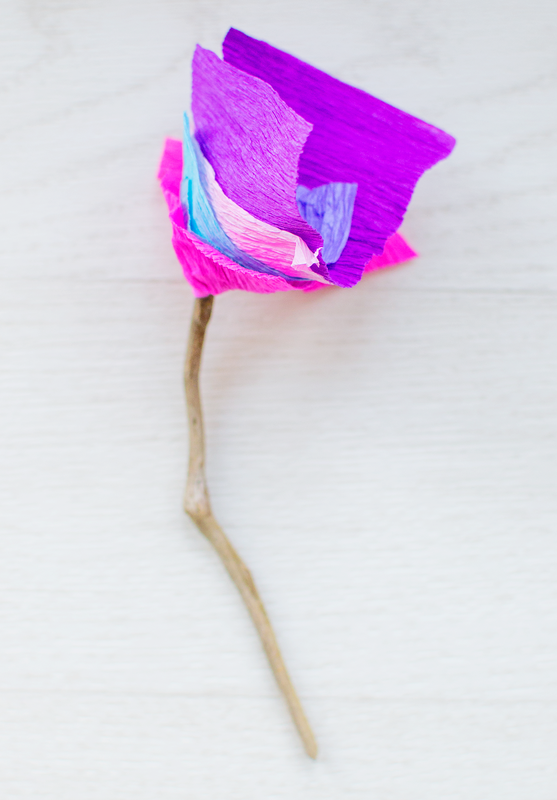 – Glue: This is optional depending on what type of flower you want to make and what you want to do with them. 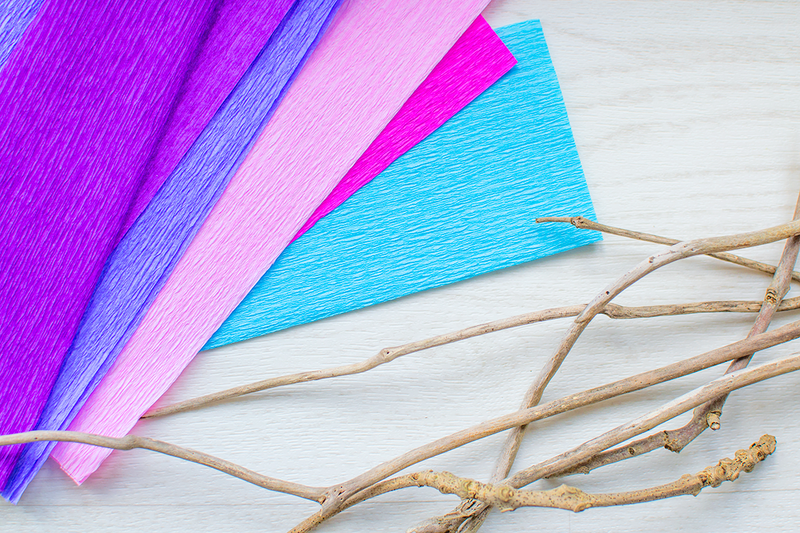 If you are sticking them straight in foam then we found the crepe paper didn’t need securing on but if you want to transport them or if your paper isn’t thick enough to stay in place then using some glue around the stick will secure them on. 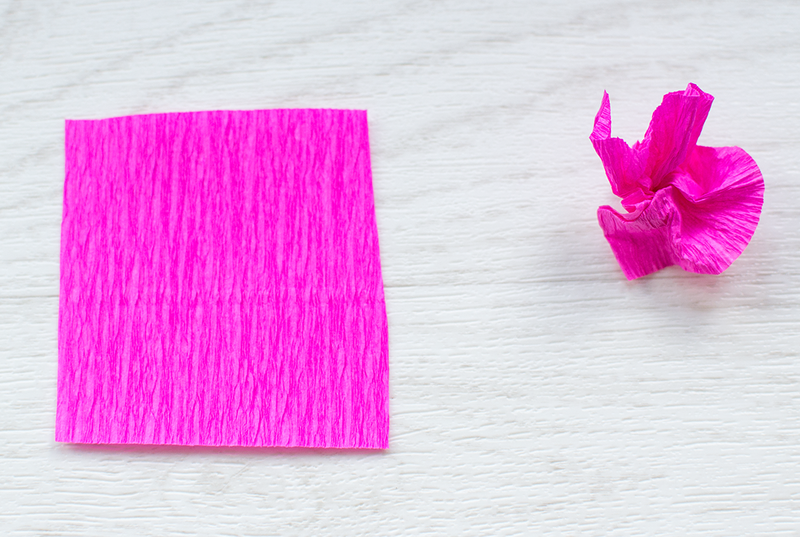 Step one for either type of flower is to cut or rip a square of crepe paper. Then if you don’t want to use glue then keep them as squares but if you do want to glue them up the stick then hold the middle of the square and scrunch up the sides like I’ve done on the right of the photo below and in the photo underneath. Then pull up the sides and twist them around the stick. Cherry and Tiger loved getting involved with this, it didn’t surprise me about Cherry but this is the first time Tiger has joined in with a craft activity and he loved it. 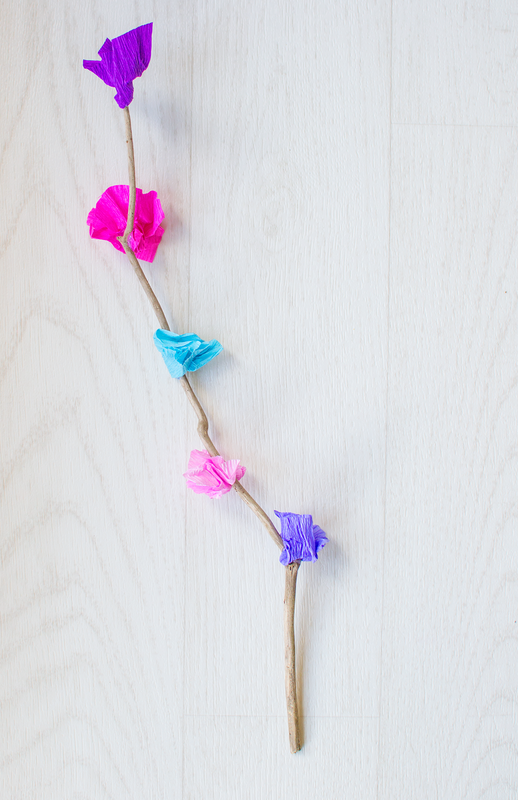 Cherry came up with the idea of putting lots of colours on one stick and the end result was really pretty. 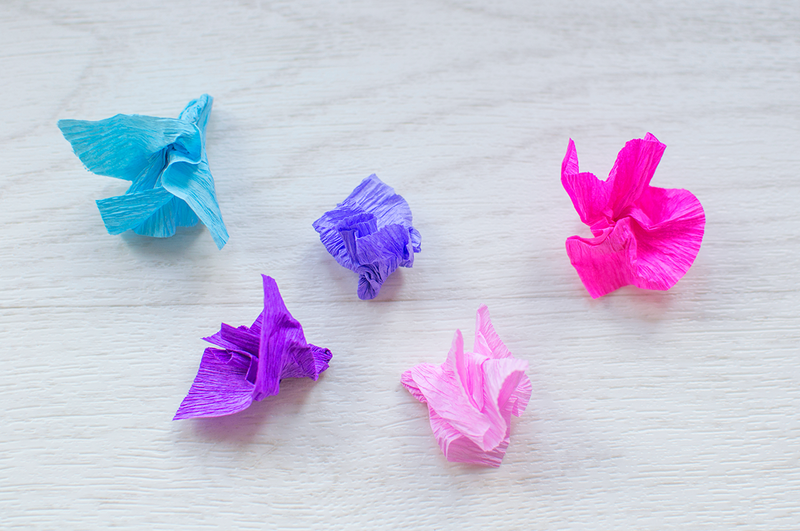 Once we had made them we stuck them in the florists foam.. 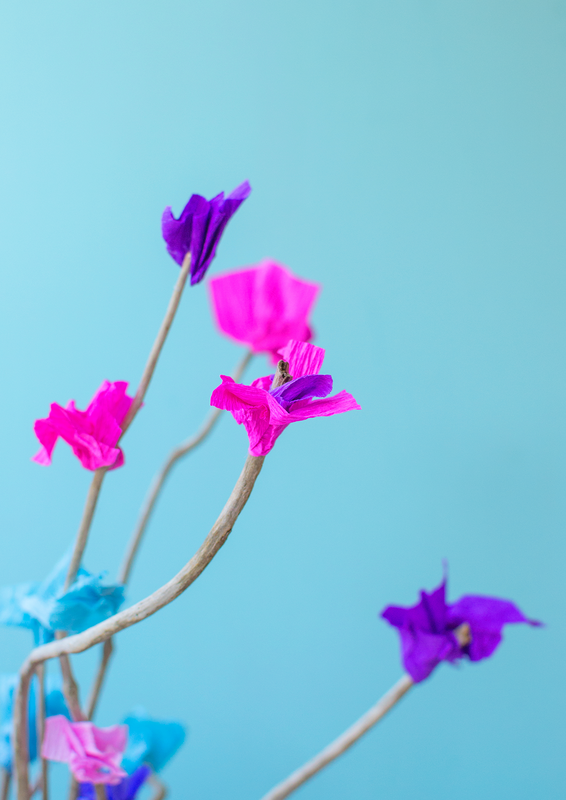 There are so many different types of handmade flowers you can make, these are so simple but look so pretty. 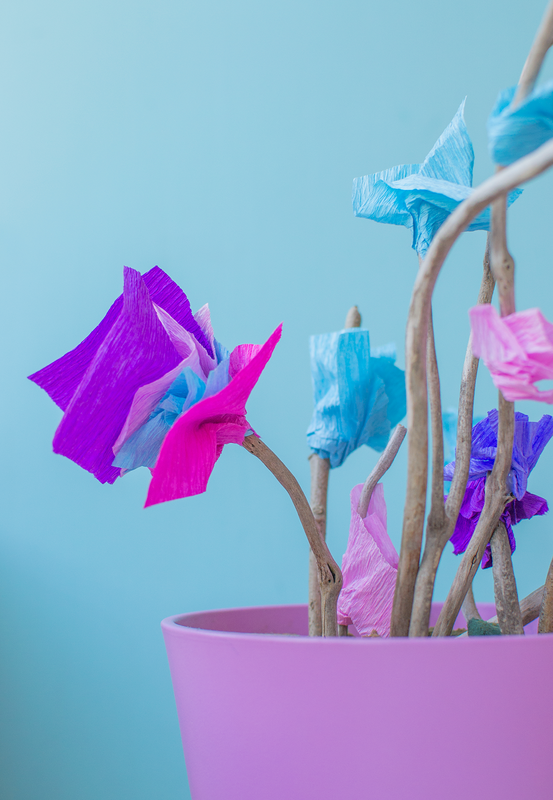 You could use all white crepe paper for weddings, or any colour you like. 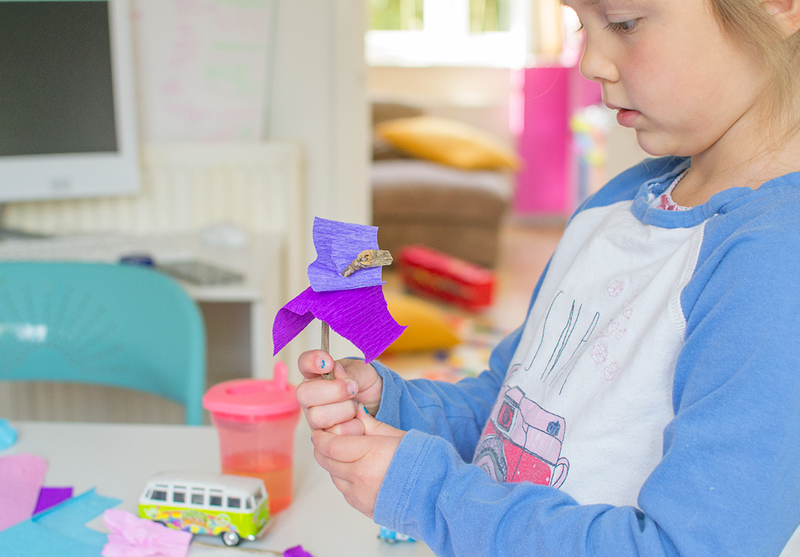 How to make super simple felt flowers. 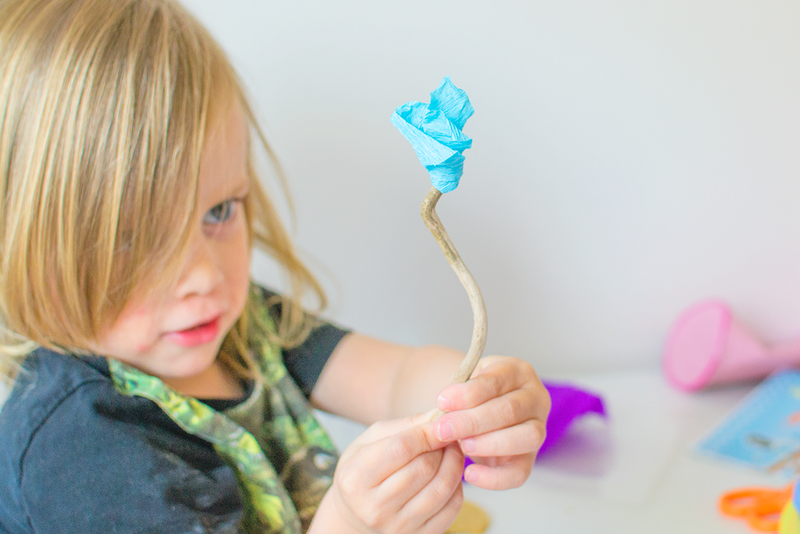 DIY flowers made with rocks and pipe cleaners. 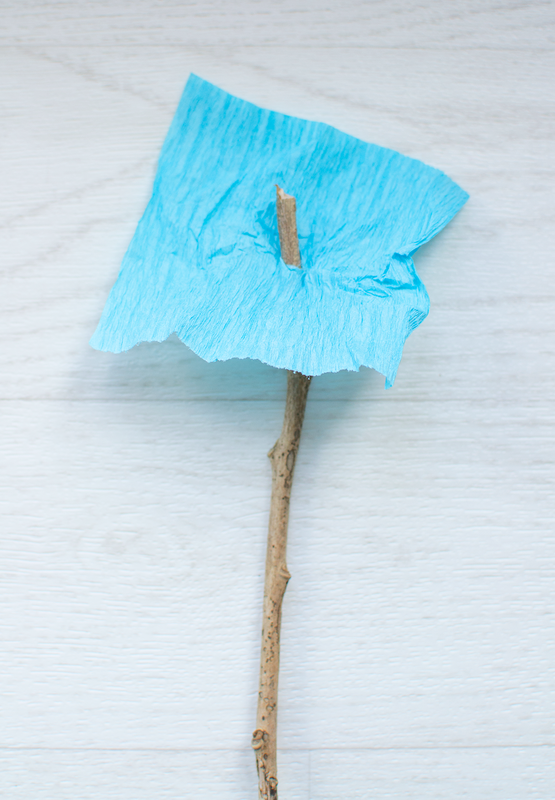 And of course my other stick flowers. For something as bit different you might like these tiny Hama Bead flowers.